Families of children who are deaf or hard of hearing (DHH) often ask Early Intervention providers, medical homes, and family organizations for resources. 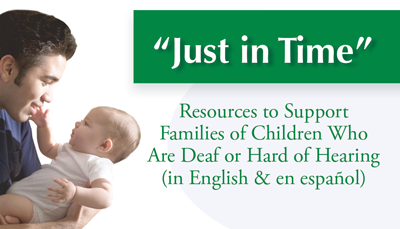 Here are essential sources of information that you can provide “just in time” to meet families’ needs. You’re welcome to copy this tool and post it on your website. Post it on your website, allowing the hyperlinks to take the reader directly to critical information. Highlight the resource in your next staff meeting or conference call. Send it electronically to your local and state partners so they also can use it. Have it available as a hard-copy handout to share with families who prefer that format. Note the emphasis on resources with information available in other languages. Is a parent-driven organization to support all families of children who are DHH across the US and Canada. Shares unbiased information about communication modalities, advocacy and more. Offers Guide By Your Side program: one-on-one family to family connections to support families with newly-identified children. Promotes Family Leadership in Language and Learning (FL3): resources to strengthen family leadership, support child language, literacy, social skills and DHH adult connections. Multiple languages: English, Spanish, Russian (more languages on local chapter pages). Developed by Boys Town National Research Hospital. Answers questions about infant hearing screening and follow up testing, steps to take after diagnosis as DHH, hearing devices, language & speech, and parenting issues. Multiple languages: Available in Spanish and English. Provides important information for families needing to connect with state newborn hearing screening programs. Features a Family Support providing links to family organizations that can help families of children who are DHH. Print materials available: Communicate With Your Child booklets and “Learning about Hearing Loss: A Roadmap for Families”. State-specific information: lists state contacts for EHDI programs and other contacts for families. Features programs and services about understanding hearing loss and how hearing is tested; finding professionals with expertise in serving babies with hearing loss; fitting a baby with a hearing device, and family support groups. Lists national organizations and state contacts. Promotes access to communication- rich environments. Supports and educates families as well as advocates for access to information about communication and literacy. Emphasizes the benefits of using visual language with young children. Offers information about options and considerations on how to select a communication approach for their child. Especially useful for families using a listening and spoken language approach. Provides information and resources to help families learn how to provide access to communication as early as possible. Provides resources for using cued speech - a visual mode of communication in which mouth movements of speech combine with “cues” to make the sounds (phonemes) of traditional spoken languages look different. Offers links to special cued speech instructors. Focuses on the role of cued speech in promoting language and literacy. Has a national web-based directory of places that offer pediatric audiology services to children ages birth to five. Helps families to find local providers. Allows providers to enter their information so that they can reach clients. State and local level contact information available. Features information about how to pursue financing for hearing devices via private insurance, Medicaid, Medicare, and charities. State-Specific information: State regulations pertaining to laws covering hearing aids. Family-led organizations in every state that connect families to peer support, including underserved populations. Provides information, education, training, support and referral services. Multiple languages: over 90 language options. Works with families of infants, toddlers, children, and youth with disabilities, including those who are DHH, ages birth to 26. Helps parents participate effectively in their children’s education and development. Partners with professionals and policy makers to improve outcomes for all children with disabilities. Multiple languages: available via most state-specific links. Offers emotional & informational support for families of children who have special needs, including those who are DHH. Provides parents with one-to-one “match” with experienced, trained volunteer support parents. Assists parents in finding information and resources. State chapters in most states as well as neighboring state support. I’m concerned about my baby’s hearing and wonder if she has a hearing loss. Who can help me? I’d like to know more about different ways to communicate with my baby- where can I get information? Who can connect me with other parents of children who are deaf or hard of hearing? My child has other needs in addition to hearing. Who can help me get information about other disabilities or health conditions? I don’t think my child is getting the early intervention services they need. Where can I learn more about my child’s early intervention and educational rights? Is there money available to get help to pay for hearing aids or other technology and services? This has been funded in part by a cooperative agreement (U52MC04391) from the Maternal and Child Health Bureau (MCHB) of the Health Resources and Services Administration (HRSA) at the United States Department of Health and Human Services.